Zerodour Flower Power is a plant supplement product that provides a long term improvement in your soil, and effective water retention, essential for flowers, vegetables and good soil. Natural minerals are used in the product to protect the roots of plants from decay, rot and disease. Moreover, it works over a long period of time. Zerodour Flower Power is the perfect solution for all types of soil whether you are growing indoors, within a greenhouse environment or outside. With food prices soaring across the globe , many of us have taken to planting vegetables or nurturing a flower garden. As those that have tried and tested this pastime will tell you, it can bring on many challenges. The soil has to be just right and improvising the earth and helping it to retain water is imperative if you want flowers that bloom and vegetables that are healthy, large and yield a full crop. Zerodour Flower Power is a plant supplement product that provides a long term improvement in your soil, and effective water retention, essential for flowers, vegetables and good soil. Natural minerals are used in the product to protect the roots of plants from decay, rot and disease. Moreover, it works over a long period of time. Zerodour Flower Power is the perfect solution for all types of soil whether you are growing indoors, within a greenhouse environment or outside. The soil will hold water which means the dynamics of any fertilizers used are greatly enhanced. All that is needed is a small amount of Zerodour Flower Power added once per month and your vegetables and flowers will grow with greater efficiency. Zerodour Flower Power uses the natural mineral called Zeolites; these are used in agriculture when growing cereals, fruit, vineyards, forage crops and of course vegetables. They have a porous structure that allows water to form a permanent reservoir in the plant's root. This procedure improves the spread of water following irrigation. Zeolites prevent nutrient loss and allow the crop to become available exactly when it's needed. Zeolites will improve the yield, growth and development of vegetables and fruits and a small application of Zerodour Flower Power once per month prevent the soil from becoming compacted, which impedes the growth of roots, lowers the ability of the water to hold its capacity and the ability of plants to ingest nutrients. Infiltration can be an issue when irrigated water does not enter the soil quickly enough to replenish the soil needed by the flowers and vegetables crop before the next irrigation. Basically Zeolites used in Zerodour Flower Power will form effective carriers, stabilizers and regulators of mineral fertilizers, which is in itself an excellent source of some nutrients. 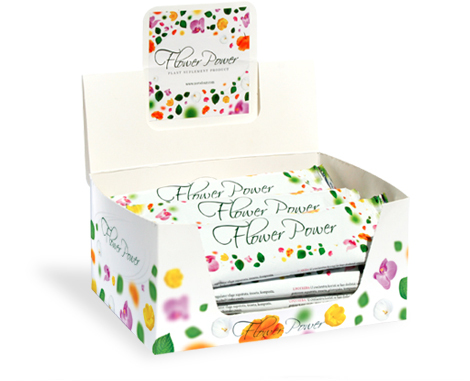 The net weight of one package of Zerodour Flower Power is 25g and one box of Flower Power contains 15 packages. 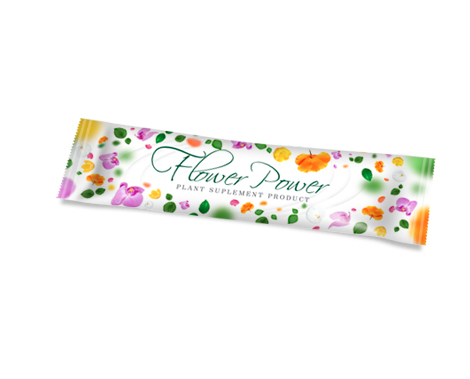 Zerodour Flower Power is 100% natural and biodegradable and will become your plant's best friend. or € 2.99 if is less than € 20.
all orders over € 20. A flat rate of just € 3.99 will be charged for all orders under € 20.